Minding The Gap is a fascinating coming of age documentary featuring the adventures of a group of young male friends as they skate around their hometown in Illinois. But the film is far more than a celebration of skateboarding as a sport and a subculture — it’s also an exploration of male friendship and masculinity crafted by the young men who actually lived it. In our exclusive interview, filmmaker Bing Liu shares how Adobe Premiere allowed the team to effectively handle the challenges of bringing together various formats (they shot over 12 years on a range of devices), collaborating remotely (Bing was in Chicago and Joshua was in LA) and the emotional weight of editing a film about your own life. PH: Can you discuss a bit about what inspired Minding the Gap and how you become involved with the project? Bing Liu: As I was entering my 20's, I kept noticing peers I'd met or grown up with struggling with addiction, depression, or worse. It was a time when my work was becoming more introspective and personal and from my community. I'd just come off of making two short films: one about two Vietnamese immigrants that delved into their search for identity while reckoning with their pasts and another about the role skateboarding photographers/videographers play within skate culture. I wanted my next film to grow out of the themes explored in these two projects: how do skateboarders find their identity and grow up when they've had a traumatic past? That was where the seed of Minding the Gap was planted. PH: What did the pre-production process look like? 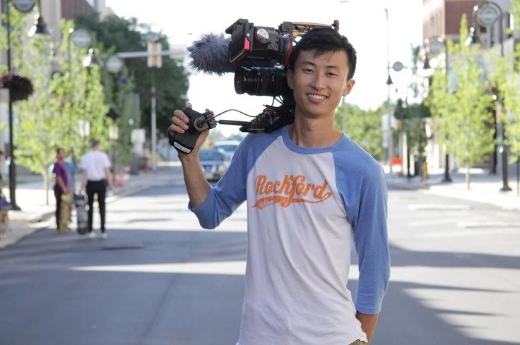 Bing Liu: I drove around the country for over a year, reconnecting with past acquaintances and meeting new ones, interviewing them about what keeps them up at night, their relationships with their families, how they find the spirit to keep chugging along. I eventually identified a handful of participants whom I kept going back to. But it wasn't until I partnered up with Kartemquin Films in Chicago that I ended up selecting the two primary characters the film would end up tracking for several years. PH: What styles did you incorporate? How did you determine the "look" of the film? Bing Liu: I had a background as a camera assistant in the narrative and commercial space, so my interviews were carefully composed and lit. I watched a lot of observational documentaries and drew from my instincts from when I taught myself how to shoot as a teenager. I shot in flat color profiles to give myself a room in the finishing grade. In the grade, I referenced to our colorist Tyler Roth gritty independent films shot on film in the 90's: Kids, Pi, Gummo. PH: Can you talk a bit about working with Adobe Premiere and why it was a perfect choice? Bing Liu: I used multiple formats and cameras over many years, from DSLRs to camcorders to my main camera the Canon C300. But I eventually drew even from miniDV archival tapes. I'd heard how well Premiere could handle multiple formats without having to transcode, which was perfect for me because I was doing all of it myself for many years. PH: What are some of the challenges associated with bringing together various formats and how did you tackle those? Bing Liu: Premiere handled all the various formats wonderfully. I think the only thing I had to transcode was footage from a Sony x70. But even with the archival miniDV material, I would just capture it right into the project. PH: What were some of your favorite moments while working on the film? Bing Liu: When we finally showed all the main participants the close-to-finished film to make sure they didn't hate it, and they all were on-board, it was both a collective sigh of relief and the start of a new journey that I think is still getting processed by everyone involved. PH: Can you also touch on the challenges of collaborating remotely? What was the most difficult and how did you handle those? What were some of the benefits? Bing Liu: We had a few cloned hard drives: one in LA that editor Josh Altman held onto, one at Kartemquin for safe-keeping backup, and one with me. The material that was being added all the time, like temp tracks, archival and graphics we used a shared Dropbox folder that would automatically sync on our computers and Premiere would point towards when opening the projects. Once we got our workflow going, which is always the most difficult and crucial part, it was pretty smooth sailing. The bulk of my work with Josh happened in a span of 2 months, though, when we holed up in an Airbnb and edited side-by-side on our laptops on a kitchen table. When we did work remotely though, Josh and I used Realtime Board to card out the film and we'd just send a project file and point the other person to the right timeline to watch. If something didn't sync up, we'd just export and send a private link. I actually bought a laptop and lightweight external monitor for the final year of editing, when I knew I'd be traveling a lot — I ended in some ridiculous situations where I'd be editing at the airport sandwich shop or transcribing footage in the back of a Lyft. PH: What other projects (that you're allowed to talk about) are you excited to be working on? Bing Liu: I'm co-directing my next film with Josh Altman and we're telling a story of young men coming-of-age while growing up in parts of Chicago most affected by gun violence. Bing Liu: Just a thanks to the amazing team that helped bring Minding the Gap to life: producer Diane Quon, editor Josh Altman, composer Nathan Halpern, sound mixer Jim Lebrecht, all of our executive producers Justine Nagan, Gordon Quinn, Steve James, Sally Jo Fifer, Chris White — and the many tireless, dedicated, loving staff members at Kartemquin.